Adorned with your mask, snorkel, and fins, you leap off the boat into an idyllic marine scene teeming with fish, corals, and for the luckiest divers, a glimpse of some charismatic megafauna. Unfortunately, among all the sights that you encounter during your snorkel, or watching that episode of Blue Planet from your couch, you won’t see any of the most important players in the marine ecosystem: the viruses! Don’t panic- these aren’t the viruses that are going to make you sick to your stomach (hopefully). Marine viruses are an abundant and ubiquitous part of oceanic ecosystems, where they play critical roles influencing the life and behavior of all organisms.Every drop of seawater is filled with millions of viruses. In fact, there are more viruses in a single liter of seawater than there are humans on the planet. Yet, despite the abundance of marine viruses and their constant barrage on all cellular life in the oceans, they are rarely included in models of oceanic food webs and biogeochemistry. Marine viral communities are dominated by phages (viruses that infect bacteria). The field of phage ecology has come a long way since the days of simply thinking of phages as mortality agents. Recent research has illuminated important subtleties of infection dynamics, including a large continuum of infection efficiencies and fundamental differences in metabolism between infected and uninfected cells. 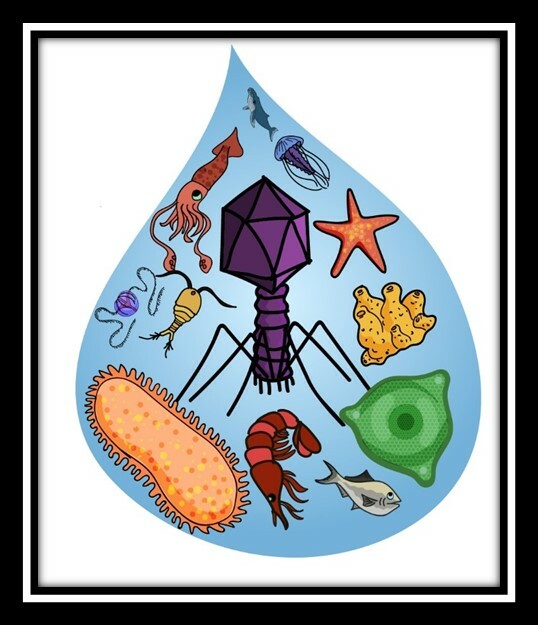 This paper reviews current knowledge of marine phage ecology, focusing on the roles of phages as puppet masters, tinkering with the behavior of their bacterial hosts through the expression of auxiliary metabolic genes and the modulation of host gene expression.We place the size of viruses in context with other members of the marine ecosystem, discuss the potential contributions of phage particles to the dissolved organic matter pool, and consider the relative influence of phage infection on the strength of the biological pump. We emphasize the limitations of bulk measurements and average virus-to-bacteria ratios in describing ecologically relevant contact rates and interactions between phages and susceptible hosts. Finally, we hypothesize how the constant warfare between phage and their hosts impacts diversity. 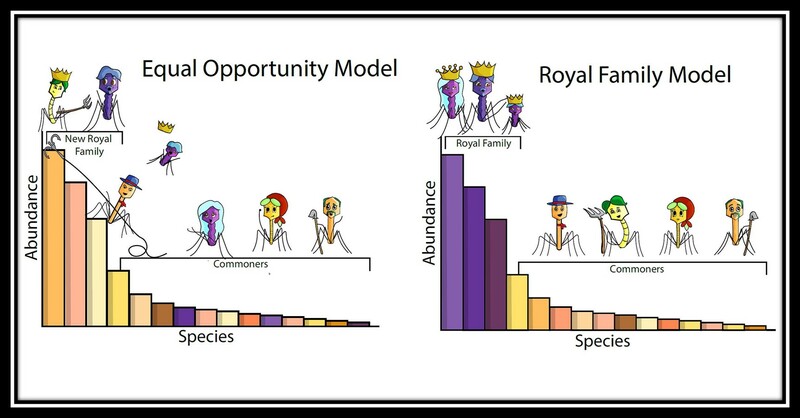 To provide a framework for investigating the succession of phage and host lineages over time, we propose the “Royal Family Model”. In this model, the royal family, which is distinct in different areas (“kingdoms”) is composed of the dominant bacterial and phage populations, while all the other phages and hosts comprise the commoners. 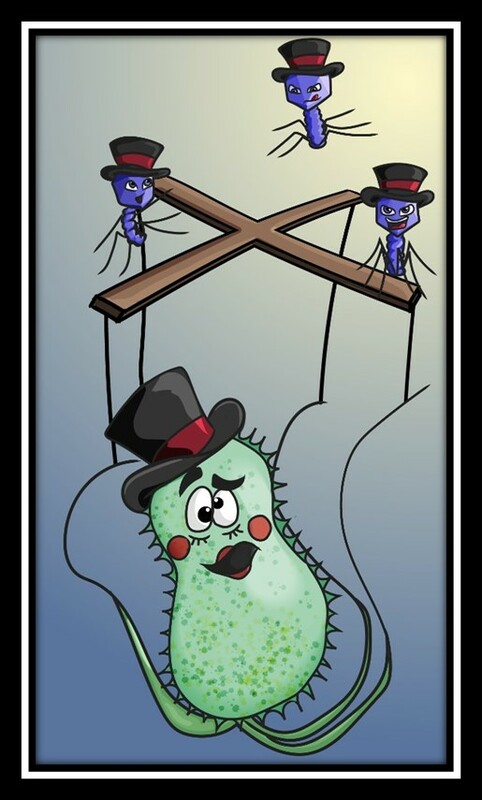 We hypothesize that members of the royal family are abundant because they are optimized to that niche, and upon death of the ruling bacterial monarch and subsequent decline in abundance of its phages, the next ruler is likely to be a descendent of the royal family that has acquired resistance to its dominant phage predators, as opposed to a commoner that scaled the steep rank-abundance plot to rise to rule. Alternatively, in the equal opportunity model, all hosts and their respective phages would have an equal chance to fill the empty niche. While future work is needed to examine phage and host succession in the oceans, initial evidence appears to support the royal family model, where hosts who are well-suited for the niche remain in power. This arms-race between interacting phage-host pairs is seen as fine-scale microdiversity changes, while coarse-scale diversity (such as that measured by conserved genetic targets) remains relatively unchanged. So the next time you take a dip in the sea, remember – you’re among royalty! An improved approach for genome reconstruction, even from soil!